Thoughts about creativity and how it relates to vulnerability have been running through my head lately. These two go hand in hand. It is impossible to be creative and not be vulnerable. Being creative is risky. Sharing a new idea in a meeting or with a group of people is scary stuff! You are laying out your “new baby” for everyone to see, knowing full well that someone could say, “That baby is ugly.” If that happens enough, you soon learn to not take the risk; you learn to keep your mouth shut. Sometimes, it just takes experiencing this one time for you to clam up and not share your ideas ever again. Claude Monet and Edgar Degas were founders of the Impressionistic style. But, did you know, that the term was originally an insult to the style? “You can’t really paint, that’s just your impression of that landscape!” Monet and Degas and others were told their babies were ugly. Instead of shrinking away, they kept at it. They kept painting. They stayed open ev en though you know the disapproving sneers had to hurt. But, by being and remaining open, people began to take a better look and they saw the beauty of their paintings. 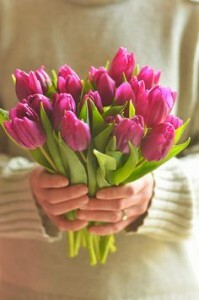 Last week, I gave a great friend a dozen dark pink tulips. They were beautiful in color and had not yet begun to spread their petals. 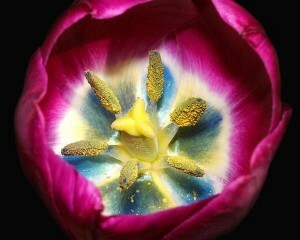 The next day, the petals opened and revealed a stunning inner beauty. At the bottom of the cup (tulips look like pretty cups to me), was an unexpected splash of teal. She said no one really commented on her flowers until the blooms opened in all their glory. They were pretty before but when they opened up they were incredible! I am sure there is some Bible verse that goes along with this writing. But thinking of one at this point seems like proof-texting. For me, what I would really like to focus on is two points. One, we are all tulips. We each have a stunning inner beauty. Knowing that it is risky, the choice is yours whether to show it or not. I hope you do. Second, when we see someone else’s tulip opening, when we witness that vulnerability, we must treat it gently and tenderly. Whether you like what you see or not, whether you think it is a good idea or not, the vulnerability is a thing of beauty.